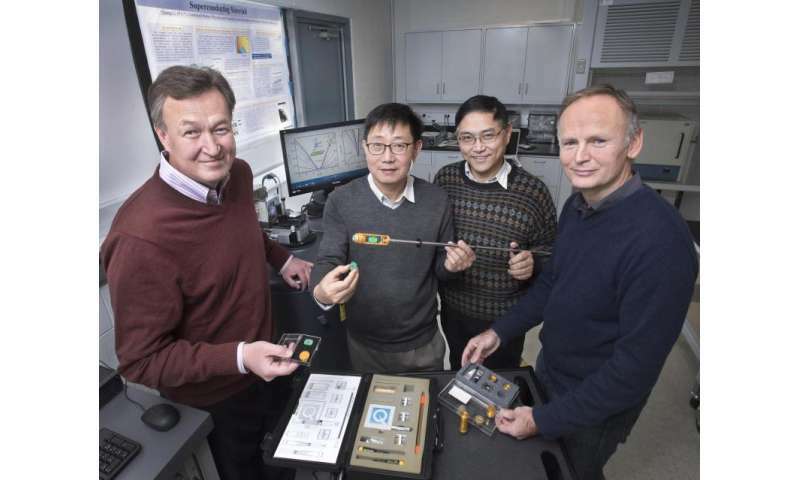 Scientists at the U.S Department of Energy's (DOE) Brookhaven National Laboratory and Stony Brook University have discovered a new way to generate very low-resistance electric current in a new class of materials. The discovery, which relies on the separation of right- and left-"handed" particles, points to a range of potential applications in energy, quantum computing, and medical imaging, and possibly even a new mechanism for inducing superconductivity—the ability of some materials to carry current with no energy loss. The material the scientists worked with, zirconium pentatelluride, has a surprising trait: When placed in parallel electric and magnetic fields, it responds with an imbalance in the number of right- and left-handed particles—a chiral imbalance. That imbalance pushes oppositely charged particles in opposite directions to create a powerful electric current. This "chiral magnetic effect" had long been predicted theoretically, but never observed definitively in a materials science laboratory at the time this work was done. In fact, when physicists in Brookhaven's Condensed Matter Physics & Materials Science Department (CMP&MS) first measured the significant drop in electrical resistance, and the accompanying dramatic increase in conductivity, they were quite surprised. "We didn't know this large magnitude of 'negative magnetoresistance' was possible," said Qiang Li, a physicist and head of the advanced energy materials group in the department and a co-author on a paper describing these results just published in the journal Nature Physics. But after teaming up with Dmitri Kharzeev, the head of the RIKEN-BNL theory group at Brookhaven and a professor at Stony Brook, the scientists had an explanation. Kharzeev had explored similar behavior of subatomic particles in the magnetic fields created in collisions at the Lab's Relativistic Heavy Ion Collider (RHIC), a DOE Office of Science User Facility where nuclear physicists explore the fundamental building blocks of matter. He suggested that in both the RHIC collisions and zirconium pentatelluride, the separation of charges could be triggered by a chiral imbalance. "We looked at the data and we said, 'Gee, that's it!' We tested six different samples and confirmed that no matter how you do it, it's there as long as the magnetic field is parallel to the electrical current. That's the smoking gun," Li said. Right- or left-handed chirality is determined by whether a particle's spin is aligned with or against its direction of motion. In order for chirality to be definitively established, particles have to behave as if they are nearly massless and able to move as such in all three spatial directions. While free-flowing nearly massless particles are commonly found in the quark-gluon plasma created at RHIC, this was not expected to occur in condensed matter. However, in some recently discovered materials, including "Dirac semimetals"—named for the physicist who wrote the equations to describe fast-moving electrons—nearly massless "quasiparticle" versions of electrons (and positively charged "holes") propagate through the crystal in this free manner. Some aspects of this phenomenon, namely the linear dependence of the particles' energy on their momentum, can be directly measured and visualized using angle-resolved photoemission spectroscopy (ARPES). "On first sight, zirconium pentatelluride did not even look like a 3D material," said Brookhaven physicist Tonica Valla, who performed the measurements with collaborators at the Advanced Light Source (ALS) at Lawrence Berkeley National Laboratory and at Brookhaven's National Synchrotron Light Source (NSLS, https://www.bnl.gov/ps/nsls/about-NSLS.asp)—two additional DOE Office of Science User Facilities. "It is layered, similar to graphite, so a quasi-2D electronic structure would be more expected. However, as soon as we did the first ARPES measurements, it was clear that the material is a 3D Dirac semimetal." "This chiral imbalance gives a big boost to the separation of the oppositely charged particles, which can be connected through an external circuit," Kharzeev said. And once the chiral state is set it's hard to alter, "so very little energy is lost in this chiral current." The dramatic conductivity and low electrical resistance of Dirac semimetals may be key to potential applications, including "quantum electricity generators" and quantum computing, Li said. "In a classic generator, the current increases linearly with increasing magnetic field strength, which needs to be changing dynamically. In these materials, current increases much more dramatically in a static magnetic field. You could pull current out of the 'sea' of available quasiparticles continuously. It's a pure quantum behavior," Li said. Separating the two chiral states could also give a new way of encoding information—analogous to the zeros and ones of computing. And because the chiral state is very stable compared with other electrical states, it's much less prone to interference from external influences, including defects in the material. It could therefore be a more reliable material for quantum computing, Li said. Kharzeev has some other ideas: "The resistance of this material drops as the magnetic field strength increases, which could open up a completely different route toward achieving something like superconductivity—zero resistance," he said. Right now the materials show at least some reduction in resistance at temperatures as high as 100 Kelvin—in the realm of the best high-temperature superconductors. But there are many different types of Dirac semimetals to experiment with to explore the possibility of higher temperatures or even more dramatic effects. Such low-resistance materials could help overcome a major limit in the speed of microprocessors by reducing the dissipation of current, Kharzeev added. "In zirconium pentatelluride and other materials that have since been discovered to have the chiral magnetic effect, an external magnetic field is required to start reducing resistivity," Valla said. "However, we envision that in some magnetic materials, the electrical current could flow with little or no resistance in a direction parallel with the material's internal magnetic field. That would eliminate the need for external magnetic fields and would offer another avenue for dissipationless transport of electrical current." Kharzeev and Li are also interested in exploring unusual optical properties in chiral materials. "These materials possess collective excitations in the terahertz frequency range, which could be important for wireless communications and also in imaging techniques that could improve the diagnosis of cancer," Kharzeev said. Getting back to his nuclear physics roots, Kharzeev added, "The existence of massless quasiparticles that strongly interact makes this material quite similar to the quark-gluon plasma created in collisions at RHIC, where nearly massless quarks strongly interact through the exchange of gluons. So this makes Dirac semimetals an interesting arena for testing some of the ideas proposed in nuclear physics." "This research illustrates a deep connection between two seemingly unrelated fields, and required contributions from an interdisciplinary team of condensed matter and nuclear physicists," said James Misewich, the Associate Laboratory Director for Energy Science at Brookhaven Lab and a professor of physics at Stony Brook University, who played the central role of introducing the members of this research team to one another. "We're fortunate to have scientists with expertise in these fields here at Brookhaven and nearby Stony Brook University, and the kind of collaborative spirit to make such a project come to fruition," he said. Now this makes me wonder: If you can 'disect' this in-medium electron into its chiral components, and if the Electro-Weak force couples distinctly to the different chiral components ... wouldn't this allow you to create a macroscopic currents of different electroweak charges? Now THAT would have applications!